The NCAA football season heads into week 6. Alabama remains No. 1 in the nation and Nick Saban’s team will go up against Arkansas at the weekend. The Crimson Tide is heavily favored against the Razorbacks. Despite being No. 1, Alabama versus Arkansas is not the marquee game of the weekend. The marquee tag falls to Oklahoma versus Texas. The two long-time rivals will renew their disdain for each other at the Cotton Bowl. Oklahoma goes into the game as the No. 7 team in the nation while Texas is No. 19. Some NCAA football insiders claim Texas is back to its best. The Longhorns’ game against Oklahoma will be the true test to see if they are. If Texas can knock off the Sooners, the team could make a significant move up the standings. Oklahoma has won the last two meetings between the teams. 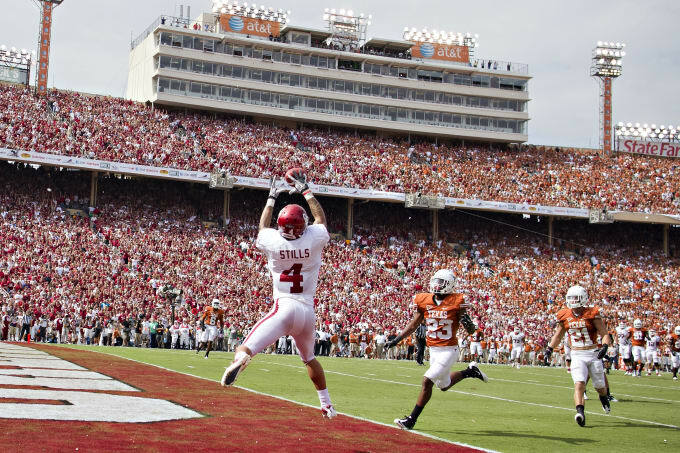 The Sooners have recorded wins in six of their last eight Red River Rivalries. Head coach Lincoln Riley has led the Sooners to 5-0, while his opponents on Saturday have has recorded a 4-1 record. The LSU Tigers and the Florida Gators meet in another top 25 game. LSU has won on its last two trips to Gainesville. The Tigers have won six of the last eight games against the Gators overall. Last season’s meeting saw the game finish 17-16 in Baton Rouge. No. 6 Notre Dame travels to No. 24 Virginia Tech to play the Hokies. Notre Dame is undefeated with high-profile wins over Michigan and Stanford. Currently, this is the Fighting Irish’s last game against a top 25 opponent. The two teams last met in 2016 with Virginia Tech winning 34-31. No. 4 Clemson travel to Wake Forest. The Tigers barely overcame Syracuse last weekend and needed a game-winning drive from backup quarterback Chase Brice. Starting Quarterback Trevor Lawrence isn’t guaranteed to start, which could sway this game and its scoreline. Brice kept Clemson’s hopes of a national title alive. He wasn’t just Clemson’s backup quarterback, he was the team’s third-string signal caller. Ohio State, currently ranked No. 3 in the nation, host Indiana. The Hoosiers have gone over 30 years without winning at the Horseshoe. There is little chance Indiana will be able to upset Urban Meyer’s team. Or is there? Last season, Ohio State lost the week following its win over Penn State. Could lightning strike twice? NCAA football is a few months away from the College Football Playoffs. However, ZCode System’s playoff simulator has made its predictions based on the current top four. 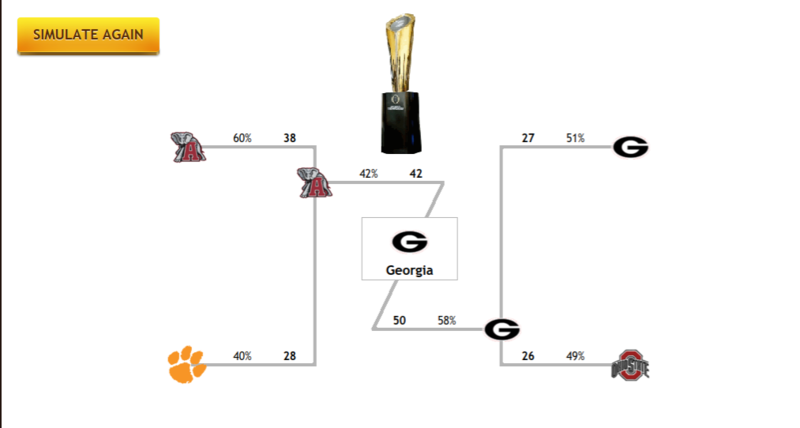 ZCode System’s playoff simulator likes final between Georgia and Alabama. There is obviously a few things that must go both teams way for this final to occur. 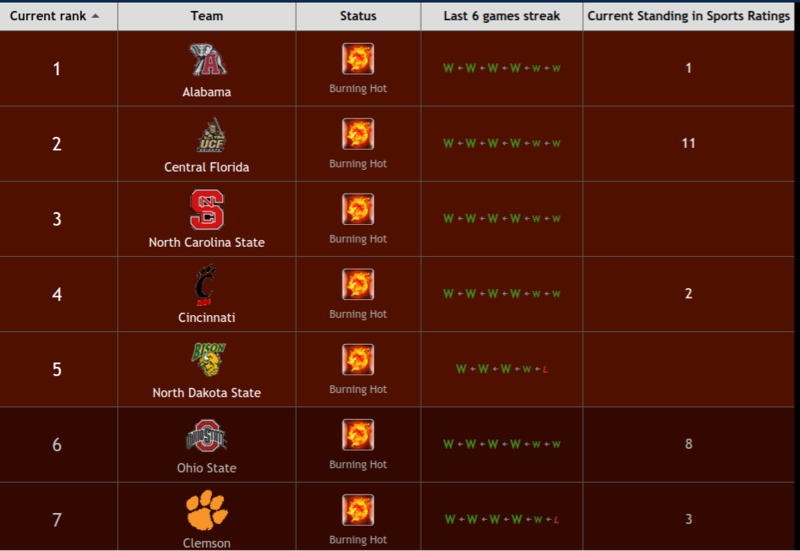 Bettors looking for an upper-hand in NCAA football this weekend can find valuable information in the latest ZCode System’s power rankings.